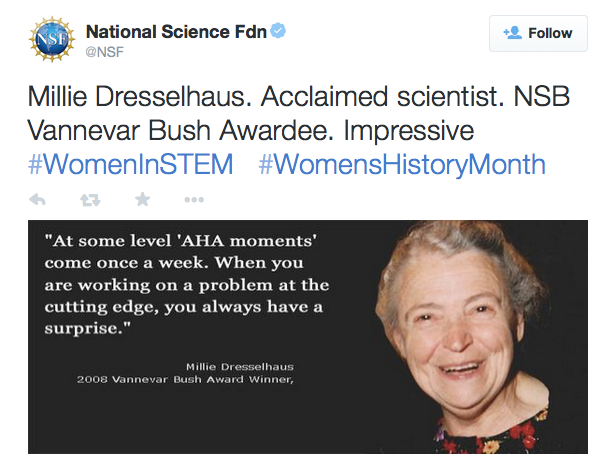 The National Science Foundation @NSF has been tweeting about Impressive #WomenInSTEM for #Women’s History Month. Here is Professor Dresselhaus’ page at the MIT Physics Department Website, citations of her work in Google Scholar, and her bio on the American Institute of Physics Website. Thanks to librarian Sam Kome for sharing the NSF tweets! This entry was posted in Uncategorized and tagged physics. Bookmark the permalink.